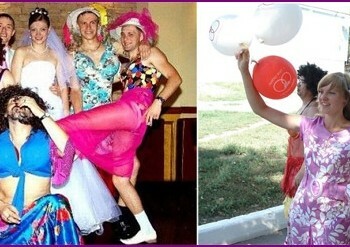 Wedding - an important event, and any bridewant to visit on holiday do not get bored, and fun, remembering after a time, a celebration with a laugh. Festival guests will remember for a long time, if you are organizing a wedding competition "hat" (it is also called - "Mind reading"), which makes an unforgettable impression and blends harmoniously into the picture in the evening. How to properly prepare the event, that was fun? The essence of the competition - to "read thoughts" and guestsnewlyweds with a magic hat. In a trial involving all the guests, including the bride and groom. Leading causes of volunteers on the ground in front of other guests or chooses candidates freely moving around the room. The event begins with the words leading "And now we have the original contest - we'll read your mind with the help of a magic hat!". After these words the hall make a headdress. Leading approaches the first participant by askingquestion: "Check what you think now? ", receiving his consent, he puts his hat on his head. In response recordist includes the first audio track, which imitates the "thought" party. If the music is matched successfully, the company rolled out laughing from the very first minutes of the test, as the video below. Then toastmaster coming to the next candidate,He puts on a headdress on him. The pauses between the performance of the participants filled fun comments, hints and lead guests celebration. The duration of the event depends on the reaction of the public, if ridiculous - continue to "read the mind" - if not, it is desirable not to delay competition. 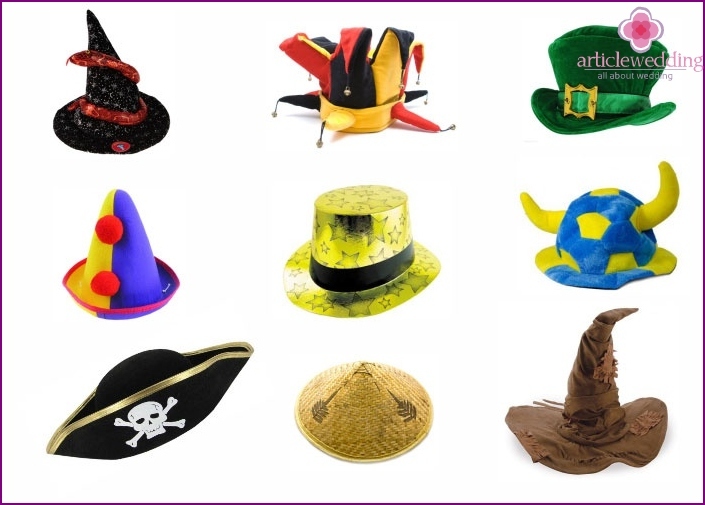 Props - hat and cutting various musicalsongs. Headgear choose at will. Cowboy hat, cocked hat, cap wizard pretty panama, ethnic hat with horns, jester hat, straw hat (pictured below) - give free rein to their imagination. Choose an accessory to the rigid structure that does not lose its shape. It is desirable that the headdress was a bright, attracted the attention of visitors. When choosing a hat guided by its weight - it should be easy to ladies were not afraid to mash your hair. Musical numbers are prepared in advance. Ringtones chosen unexpected, fun, funny, loud, sounding clear, lasting no more than 30 seconds. On the taste, use either the backing or excerpts of songs from the text. Music tracks place the order, alternating female, male tunes. Especially for you we have made a selection of songs, which is fully prepared for the contest (odd - for women, even - for men). Download music tracks in one file. At the end of the competition the leading offers a toast to the young couple and the groom - to kiss the bride. If you follow our recommendations, the event will run smoothly and will amuse the audience. You have already participated in the "Hat" contest? Share your experiences by leaving a comment.